Master cylinders are single piston, straight-bore type cylinders with a return spring, and are available with or without an integral reservoir. Two-stage master cylinders incorporate the advantage of a large piston for fluid volume and a small piston for high pressure. 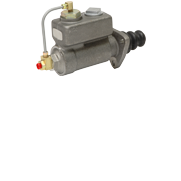 Master cylinders are available in brake fluid and mineral base hydraulic oil models with bore diameters from 0.75 to 2.25 inches and stroke ranges of 1.12 to 2.61 inches. Side and flange mounting styles are available. Most models are available with or without a residual check valve.